Use a fork to poke holes all over the potatoes. Then microwave potatoes on high until tender (about 15 minutes). Split cooked potatoes open with a knife; remove flesh and transfer to a bowl (you should have about 1 cup). Use a fork to mash potato with salt and pepper; divide potato filling among 4 tortillas. Top each with 1 heaping cup spinach, 1/4 cup cheese, and another tortilla. Heat a large nonstick skillet over medium-high heat. Working in batches, heat 1 teaspoon oil and transfer 1 quesadilla to skillet; cook until quesadilla is crisp and cheese is melted (about 3 minutes per side). Transfer cooked quesadilla to serving plate. Repeat with remaining oil and quesadillas. Cut quesadillas in quarters and serve. Toss together the sweet potatoes, onion, 1 tablespoon oil, 1/2 teaspoon salt, and 1/4 teaspoon pepper on a rimmed baking sheet. Roast 20–25 minutes or until tender. Meanwhile, heat remaining 1 tablespoon oil in a skillet over medium-high heat. Season chicken with remaining 1/2 teaspoon salt and 1/4 teaspoon pepper, and cook for 5–6 minutes per side or until chicken is golden and cooked through. 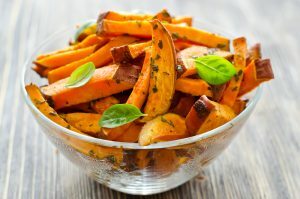 Toss the sweet potato–onion mixture with spinach and fresh lime juice. Serve warm with chicken. Heat oil in a large saucepan over medium-high heat. Add shallots or onions; saute 3 minutes or until tender. Add potato, carrots, ginger, and curry; cook 2 minutes. Add broth; bring to a boil. Cover, reduce heat, and simmer 25 minutes or until vegetables are tender; stir in salt. Pour half of soup in a food processor; pulse until smooth. Repeat procedure with remaining soup.